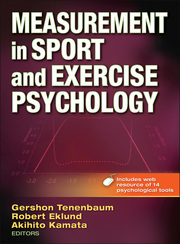 Welcome to the ancillary website for Measurement in Sport and Exercise Psychology. Instructor resources are free to course adopters and granted by your sales representative. To request access, contact your sales rep.
Student resources are included with the purchase of a new text or eBook; otherwise, they may be purchased separately. To access your resources, you must first Create an Account. Once registered, sign in and click the links in the left column to view your resources or enter your key code. Some of these files are in Microsoft Office® formats. If you do not have software that allows you to open or view these files, free software is available for download at OpenOffice.org that will allow you to do so. Human Kinetics, Inc., is not affiliated with OpenOffice.org in any way. Key code instructions: If you have purchased a key code, sign in. Then click on "Enter Key Code" in the left column. The Web Resource includes 14 measurement instruments in their entirety. This resource also contains tables presenting information on many additional instruments and web links to find them when applicable.